There are more than 4,000 registered churches in Kenya, belonging to an innumerable variety of denominations. They can range from very mainstream churches, to lesser-known evangelical and gospel offshoots. 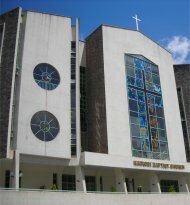 Churches in Kenya are predominately Christian, though many different denominations and congregations exist within the population. Overall, more than three quarters of the population identify themselves as Christian (either Protestant or Roman Catholic). However, many Kenyans mix their Christian beliefs with traditional beliefs (such as belief in witchcraft). Most of the well-established churches in Kenya have their roots in early missionary work, when Europeans first took an interest in the area and they saw an opportunity to preach to a wide new audience. The concept of Catholicism first arrived in Kenya in 1498, when a Portuguese trader erected a cross on the coastal shore near Malindi. Catholic missionaries began traveling to Kenya in the late 1500s, but the country didn't start to have an official Church presence until the 1900s. By that time, there were a number of missions and Kenyan priests were starting to be ordained. The first Kenyan dioceses were established in 1953, for Nairobi, Nyeri, Kisimu and Meru. Today there are 26, and more than 7 million baptized Kenyans. Nine hundred of the country's congregations are Methodist, with a membership of roughly half a million people. 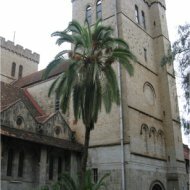 The Church established its presence in Kenya in 1860, with missionaries from the United Methodist Free Church. The Methodist Church in Kenya has expanded its works to include the Kenya Methodist University and Maua Methodist Hospital. The first Anglican missionaries came to Kenya in 1844, and over the years they translated much of the Bible into the local languages in order to help preach to the locals. The Church today has 29 dioceses and over 5 million members. There are 6 Anglican theological colleges in Kenya as well. Their Uzima publishing house helps them provide Christian books for Africans (some titles are in Kiswahili, but most are in English). As with the other churches in Kenya, Pentecostalism came to Africa first through European missionaries in 1912. This denomination is relatively new to Kenya, compared to the other mainstream denominations already mentioned. Pentecostal churches are growing quickly in popularity due to their charismatic approach to preaching, and their willingness to address Kenyans' more traditional beliefs. About 70% of the Protestant population are a member of a Pentecostal church. In 2002, East Africa was home to around 5,000 Pentecostal churches. Besides these denominations, there are numerous others with a significant presence in Kenya. Baptist, Presbyterian, gospel revivalist, Reformed, Episcopal, and Lutheran are just a small example of the variety of Kenyan churches.